When neuraxial anesthesia (epidural/spinal anesthesia) or spinal puncture is employed, patients anticoagulated or scheduled to be anticoagulated with low molecular weight heparins, heparinoids, or fondaparinux sodium for prevention of thromboembolic complications are at risk of developing an epidural or spinal hematoma which can result in long-term or permanent paralysis. The risk of these events is increased by the use of indwelling epidural catheters for administration of analgesia or by the concomitant use of drugs affecting hemostasis such as non-steroidal anti-inflammatory drugs (NSAIDs), platelet inhibitors, or other anticoagulants. The risk also appears to be increased by traumatic or repeated epidural or spinal puncture. Patients should be frequently monitored for signs and symptoms of neurologic impairment. If neurologic compromise is noted, urgent treatment is necessary. The physician should consider the potential benefit versus risk before neuraxial intervention in patients anticoagulated or to be anticoagulated for thromboprophylaxis (see also WARNINGS : Hemorrhage and PRECAUTIONS : Drug Interactions ). ARIXTRA® (fondaparinux sodium) Injection is a sterile solution containing fondaparinux sodium. It is a synthetic and specific inhibitor of activated Factor X (Xa). Fondaparinux sodium is methyl O-2-deoxy-6-O-sulfo-2-(sulfoamino)-(alpha)-D-glucopyranosyl-(1->4)-O-(beta)-D-glucopyranuronosyl-(1->4)-O-2-deoxy-3,6-di-O-sulfo-2-(sulfoamino)-(alpha)-D-glucopyranosyl-(1->4)-O-2-O-sulfo-(alpha)-L-idopyranuronosyl-(1->4)-2-deoxy-6-O-sulfo-2-(sulfoamino)-(alpha)-D-glucopyranoside, decasodium salt. Each single dose, prefilled syringe of ARIXTRA, affixed with an automatic needle protection system, contains 2.5 mg of fondaparinux sodium in 0.5 mL, 5.0 mg of fondaparinux sodium in 0.4 mL, 7.5 mg of fondaparinux sodium in 0.6 mL, or 10.0 mg of fondaparinux sodium in 0.8 mL of an isotonic solution of sodium chloride and water for injection. The final drug product is a clear and colorless to slightly yellow liquid with a pH between 5.0 and 8.0. Pharmacodynamics: Mechanism of Action: The antithrombotic activity of fondaparinux sodium is the result of antithrombin III (ATIII)-mediated selective inhibition of Factor Xa. By selectively binding to ATIII, fondaparinux sodium potentiates (about 300 times) the innate neutralization of Factor Xa by ATIII. Neutralization of Factor Xa interrupts the blood coagulation cascade and thus inhibits thrombin formation and thrombus development. Anti-Xa Activity: The pharmacodynamics/pharmacokinetics of fondaparinux sodium are derived from fondaparinux plasma concentrations quantified via anti-Factor Xa activity. Only fondaparinux can be used to calibrate the anti-Xa assay. (The international standards of heparin or LMWH are not appropriate for this use.) As a result, the activity of fondaparinux sodium is expressed as milligrams (mg) of the fondaparinux calibrator. The anti-Xa activity of the drug increases with increasing drug concentration, reaching maximum values in approximately 3 hours. Pharmacokinetics: Absorption: Fondaparinux sodium administered by subcutaneous injection is rapidly and completely absorbed (absolute bioavailability is 100%). Following a single subcutaneous dose of fondaparinux sodium 2.5 mg in young male subjects, C max of 0.34 mg/L is reached in approximately 2 hours. In patients undergoing treatment with fondaparinux sodium injection 2.5 mg, once daily, the peak steady-state plasma concentration is, on average, 0.39-0.50 mg/L and is reached approximately 3 hours post-dose. In these patients, the minimum steady-state plasma concentration is 0.14-0.19 mg/L. In patients with symptomatic deep vein thrombosis and pulmonary embolism undergoing treatment with fondaparinux sodium injection 5 mg (body weight <50 kg), 7.5 mg (body weight 50-100 kg) and 10 mg (body weight >100 kg) once daily, the body-weight-adjusted doses provide similar mean steady-state peaks and minimum plasma concentrations across all body weight categories. The mean peak steady-state plasma concentration is in the range of 1.20-1.26 mg/L. In these patients, the mean minimum steady-state plasma concentration is in the range of 0.46-0.62 mg/L. Distribution: In healthy adults, intravenously or subcutaneously administered fondaparinux sodium distributes mainly in blood and only to a minor extent in extravascular fluid as evidenced by steady state and non-steady state apparent volume of distribution of 7-11 L. Similar fondaparinux distribution occurs in patients undergoing elective hip surgery or hip fracture surgery. In vitro, fondaparinux sodium is highly (at least 94%) and specifically bound to antithrombin III (ATIII) and does not bind significantly to other plasma proteins (including platelet Factor 4 [PF4]) or red blood cells. Metabolism: In vivo metabolism of fondaparinux has not been investigated since the majority of the administered dose is eliminated unchanged in urine in individuals with normal kidney function. Elimination: In individuals with normal kidney function fondaparinux is eliminated in urine mainly as unchanged drug. In healthy individuals up to 75 years of age, up to 77% of a single subcutaneous or intravenous fondaparinux dose is eliminated in urine as unchanged drug in 72 hours. The elimination half-life is 17-21 hours. Hepatic Impairment: The pharmacokinetic properties of fondaparinux have not been studied in patients with hepatic impairment. Elderly Patients: Fondaparinux elimination is prolonged in patients over 75 years old. In studies evaluating fondaparinux sodium 2.5 mg prophylaxis in hip fracture surgery or elective hip surgery, the total clearance of fondaparinux was approximately 25% lower in patients over 75 years old as compared to patients less than 65 years old. A similar relationship between fondaparinux clearance and age was observed in DVT treatment patients. Patients Weighing Less Than 50 kg: Total clearance of fondaparinux sodium is decreased by approximately 30% in patients weighing less than 50 kg (see CONTRAINDICATIONS and DOSAGE AND ADMINISTRATION ). Gender: The pharmacokinetic properties of fondaparinux sodium are not significantly affected by gender. Race: Pharmacokinetic differences due to race have not been studied prospectively. However, studies performed in Asian (Japanese) healthy subjects did not reveal a different pharmacokinetic profile compared to Caucasian healthy subjects. Similarly, no plasma clearance differences were observed between Black and Caucasian patients undergoing orthopedic surgery. Drug Interactions: see PRECAUTIONS : Drug Interactions . Prophylaxis of Thromboembolic Events Following Hip Fracture Surgery: In a randomized, double-blind, clinical trial in patients undergoing hip fracture surgery, ARIXTRA Injection 2.5 mg SC once daily was compared to enoxaparin sodium 40 mg SC once daily, which is not approved for use in patients undergoing hip fracture surgery. A total of 1,711 patients were randomized and 1,673 were treated. Patients ranged in age from 17-101 years (mean age 77 years) with 25% men and 75% women. Patients were 99% Caucasian, 1% other races. Patients with multiple trauma affecting more than one organ system, serum creatinine level more than 2 mg/dL (180 µmol/L), or platelet count less than 100,000/mm 3 were excluded from the trial. ARIXTRA was initiated after surgery in 88% of patients (mean 6 hrs) and enoxaparin sodium was initiated after surgery in 74% of patients (mean 18 hrs). For both drugs, treatment was continued for 7 ± 2 days. The primary efficacy endpoint, venous thromboembolism (VTE), was a composite of documented deep vein thrombosis (DVT) and/or documented symptomatic pulmonary embolism (PE) reported up to Day 11. The efficacy data are provided in Table 1 below and demonstrate that under the conditions of the trial fondaparinux sodium was associated with a VTE rate of 8.3% compared with a VTE rate of 19.1% for enoxaparin sodium for a relative risk reduction of 56% (95% CI: 39%, 70%; p<0.001). Major bleeding episodes occurred in 2.2% of ARIXTRA patients and 2.3% of enoxaparin sodium patients (see Tables 8 and 9 under ADVERSE REACTIONS : Hemorrhage ). 1 ARIXTRA was initiated after surgery in 88% of patients (mean 6 hrs) and enoxaparin sodium was initiated after surgery in 74% of patients (mean 18 hrs). 2 Not approved for use in patients undergoing hip fracture surgery. 3 Evaluable patients were those who were treated and underwent the appropriate surgery (i.e., hip fracture surgery of the upper third of the femur), with an adequate efficacy assessment up to Day 11. 4 VTE was a composite of documented DVT and/or documented symptomatic PE reported up to Day 11. 6 Numbers in parentheses indicate 95% confidence interval. Extended Prophylaxis of Thromboembolic Events Following Hip Fracture Surgery: In a noncomparative, unblinded manner, 737 patients undergoing hip fracture surgery were initially treated during the peri-operative period with ARIXTRA 2.5 mg once daily for 7 ± 1 days. Eighty-one (81) of the 737 patients were not eligible for randomization into the 3-week double-blind period. Three hundred twenty six (326) patients and 330 patients were randomized to receive ARIXTRA 2.5 mg once daily or placebo, respectively, in or out of the hospital for 21 ± 2 days. Patients ranged in age from 23 to 96 years (mean age 75 years) and were 29% men and 71% women. Patients were 99% Caucasian and 1% other races. Patients with multiple traumas affecting more than one organ system or serum creatinine level more than 2 mg/dL (180 µmol/L) were excluded from the trial. The primary efficacy endpoint, venous thromboembolism (VTE), was a composite of documented deep vein thrombosis (DVT) and/or documented symptomatic pulmonary embolism (PE) reported for up to 24 days following randomization. The efficacy data are provided in Table 2 below and demonstrate that extended prophylaxis with fondaparinux sodium was associated with a VTE rate of 1.4% compared with a VTE rate of 35.0% for placebo for a relative risk reduction of 95.9% (95% CI = [98.7; 87.1], p<0.0001). Major bleeding rates during the 3-week extended prophylaxis period for ARIXTRA (2.4%) and placebo (0.6%) are provided in Tables 8 and 9 (see ADVERSE REACTIONS : Hemorrhage ). 1 Evaluable patients were those who were treated in the post-randomization period, with an adequate efficacy assessment for up to 24 days following randomization. 2 VTE was a composite of documented DVT and/or documented symptomatic PE reported for up to 24 days following randomization. 3 p value < 0.001. 4 Numbers in parentheses indicate 95% confidence interval. 5 p value = 0.021. 6 p value = NS. Prophylaxis of Thromboembolic Events Following Hip Replacement Surgery: In 2 randomized, double-blind, clinical trials in patients undergoing hip replacement surgery, ARIXTRA 2.5 mg SC once daily was compared to either enoxaparin sodium 30 mg SC every 12 hours (Study 1) or to enoxaparin sodium 40 mg SC once a day (Study 2). In Study 1, a total of 2,275 patients were randomized and 2,257 were treated. Patients ranged in age from 18 to 92 years (mean age 65 years) with 48% men and 52% women. Patients were 94% Caucasian, 4% Black, <1% Asian, and 2% others. In Study 2, a total of 2,309 patients were randomized and 2,273 were treated. Patients ranged in age from 24 to 97 years (mean age 65 years) with 42% men and 58% women. Patients were 99% Caucasian, and 1% other races. Patients with serum creatinine level more than 2 mg/dL (180 µmol/L), or platelet count less than 100,000/mm 3 were excluded from both trials. In Study 1, ARIXTRA was initiated 6 ± 2 hours (mean 6.5 hrs) after surgery in 92% of patients and enoxaparin sodium was initiated 12 to 24 hours (mean 20.25 hrs) after surgery in 97% of patients. In Study 2, ARIXTRA was initiated 6 ± 2 hours (mean 6.25 hrs) after surgery in 86% of patients and enoxaparin sodium was initiated 12 hours before surgery in 78% of patients. The first post-operative enoxaparin sodium dose was given before 12 hours after surgery in 60% of patients and 12 to 24 hours after surgery in 35% of patients with a mean of 13 hours. For both studies, both study treatments were continued for 7 ± 2 days. The efficacy data are provided in Table 3 below. Under the conditions of Study 1, fondaparinux sodium was associated with a VTE rate of 6.1% compared with a VTE rate of 8.3% for enoxaparin sodium for a relative risk reduction of 26% (95% CI: -11%, 53%; p = NS). Under the conditions of Study 2, fondaparinux sodium was associated with a VTE rate of 4.1% compared with a VTE rate of 9.2% for enoxaparin sodium for a relative risk reduction of 56% (95% CI: 33%, 73%; p<0.001). For the 2 studies combined, the major bleeding episodes occurred in 3.0% of ARIXTRA patients and 2.1% of enoxaparin sodium patients (see Tables 8 and 9 under ADVERSE REACTIONS : Hemorrhage ). 1 In Study 1, ARIXTRA was initiated after surgery in 92% of patients (mean 6.5 hrs). 2 In Study 2, ARIXTRA was initiated after surgery in 86% of patients (mean 6.25 hrs). 3 In Study 1, enoxaparin sodium was initiated after surgery in 97% of patients (mean 20.25 hrs). 4 In Study 2, enoxaparin sodium was initiated before surgery in 78% of patients. The first postoperative dose was given a mean of 13 hrs after surgery. 5 Evaluable patients were those who were treated and underwent the appropriate surgery (i.e., hip replacement surgery), with an adequate efficacy assessment up to Day 11. 6 VTE was a composite of documented DVT and/or documented symptomatic PE reported up to Day 11. 7 p value versus enoxaparin sodium: NS. 8 Numbers in parentheses indicate 95% confidence interval. 9 p value versus enoxaparin sodium in study 1: <0.05. 10 p value versus enoxaparin sodium in study 2: <0.001. 11 p value versus enoxaparin sodium in study 2: <0.01. Prophylaxis of Thromboembolic Events Following Knee Replacement Surgery: In a randomized, double-blind, clinical trial in patients undergoing knee replacement surgery (i.e., surgery requiring resection of the distal end of the femur or proximal end of the tibia), ARIXTRA 2.5 mg SC once daily was compared to enoxaparin sodium 30 mg SC every 12 hours. A total of 1,049 patients were randomized and 1,034 were treated. Patients ranged in age from 19 to 94 years (mean age 68 years) with 41% men and 59% women. Patients were 88% Caucasian, 8% Black, <1% Asian, and 3% others. Patients with serum creatinine level more than 2 mg/dL (180 µmol/L), or platelet count less than 100,000/mm 3 were excluded from the trial. ARIXTRA was initiated 6 ± 2 hours (mean 6.25 hrs) after surgery in 94% of patients, and enoxaparin sodium was initiated 12 to 24 hours (mean 21 hrs) after surgery in 96% of patients. For both drugs, treatment was continued for 7 ± 2 days. The efficacy data are provided in Table 4 below and demonstrate that under the conditions of the trial, fondaparinux sodium was associated with a VTE rate of 12.5% compared with a VTE rate of 27.8% for enoxaparin sodium for a relative risk reduction of 55% (95% CI: 36%, 70%; p<0.001). Major bleeding episodes occurred in 2.1% of ARIXTRA patients and 0.2% of enoxaparin sodium patients (see Tables 8 and 9 under ADVERSE REACTIONS : Hemorrhage ). 1 Patients randomized to ARIXTRA 2.5 mg received the first injection 6 ± 2 hours after surgery providing that hemostasis had been achieved. 2 Patients randomized to enoxaparin sodium received the first injection at 21 ± 2 hours after surgery closure providing that hemostasis had been achieved. 3 Evaluable patients were those who were treated and underwent the appropriate surgery (i.e., knee replacement surgery), with an adequate efficacy assessment up to Day 11. Prophylaxis of Thromboembolic Events Following Abdominal Surgery in Patients at Risk for Thromboembolic Complications: Abdominal surgery patients at risk included the following: those undergoing surgery under general anesthesia lasting longer than 45 minutes who are over 60 years of age with or without additional risk factors; and those undergoing surgery under general anesthesia lasting longer than 45 minutes who are over 40 years of age with additional risk factors. Risk factors included neoplastic disease, obesity, chronic obstructive pulmonary disease, inflammatory bowel disease, history of deep vein thrombosis (DVT) or pulmonary embolism (PE), or congestive heart failure. In a randomized, double-blind, clinical trial in patients undergoing abdominal surgery, ARIXTRA 2.5 mg SC once daily started postoperatively was compared to dalteparin sodium 5,000 IU SC once daily, with one 2,500 IU SC preoperative injection and a 2,500 IU SC first postoperative injection. A total of 2,927 patients were randomized and 2,858 were treated. Patients ranged in age from 17 to 93 years (mean age 65 years) with 55% men and 45% women. Patients were 97% Caucasian, 1% Black, 1% Asian, 1% others. Patients with serum creatinine level more than 2 mg/dL (180 µmol/L), or platelet count less than 100,000/mm 3 were excluded from the trial. Sixty-nine percent (69%) of study patients underwent cancer-related abdominal surgery. Study treatment was continued for 7 ± 2 days. The efficacy data are provided in Table 5 below and demonstrate that prophylaxis with fondaparinux sodium was associated with a VTE rate of 4.6% compared with a VTE rate of 6.1% for dalteparin sodium (p = NS). 1 Evaluable patients were those who were randomized and had an adequate efficacy assessment up to Day 10; non-treated patients and patients who did not undergo surgery did not get a VTE assessment. 2 VTE was a composite of venogram positive DVT, symptomatic DVT, non-fatal PE and/or fatal PE reported up to Day 10. 3 p value versus dalteparin sodium: NS. Treatment of Deep Vein Thrombosis: In a randomized, double-blind, clinical trial in patients with a confirmed diagnosis of acute symptomatic DVT without PE, ARIXTRA 5 mg (body weight <50 kg), 7.5 mg (body weight 50-100 kg), or 10 mg (body weight >100 kg) SC once daily (ARIXTRA treatment regimen) was compared to enoxaparin sodium 1 mg/kg SC every 12 hours. Almost all patients started study treatment in hospital. Approximately 30% of patients in both groups were discharged home from the hospital while receiving study treatment. A total of 2,205 patients were randomized and 2,192 were treated. Patients ranged in age from 18-95 years (mean age 61 years) with 53% men and 47% women. Patients were 97% Caucasian, 2% Black and 1% other races. Patients with serum creatinine level more than 2 mg/dL (180 µmol/L), or platelet count less than 100,000/mm 3 were excluded from the trial. For both groups, treatment continued for at least 5 days with a treatment duration range of 7 ± 2 days, and both treatment groups received Vitamin K antagonist therapy initiated within 72 hours after the first study drug administration and continued for 90 ± 7 days, with regular dose adjustments to achieve an INR of 2-3. The primary efficacy endpoint was confirmed, symptomatic, recurrent VTE reported up to Day 97. The efficacy data are provided in Table 6 below. 1 Patients were also treated with Vitamin K antagonists initiated within 72 hours after the first study drug administration. 2 VTE was a composite of symptomatic recurrent non fatal VTE or fatal PE reported up to Day 97. 3 The 95% confidence interval for the treatment difference for total VTE was: (-1.8% to 1.5%). Treatment of Pulmonary Embolism: In a randomized, open-label, clinical trial in patients with a confirmed diagnosis of acute symptomatic PE, with or without DVT, ARIXTRA 5 mg (body weight <50 kg), 7.5 mg (body weight 50-100 kg), or 10 mg (body weight >100 kg) SC once daily (ARIXTRA treatment regimen) was compared to heparin IV bolus (5,000 USP units) followed by a continuous IV infusion adjusted to maintain 1.5-2.5 times aPTT control value. Patients with a PE requiring thrombolysis or surgical thrombectomy were excluded from the trial. All patients started study treatment in hospital. Approximately 15% of patients were discharged home from the hospital while receiving fondaparinux therapy. A total of 2,213 patients were randomized and 2,184 were treated. Patients ranged in age from 18-97 years (mean age 62 years) with 44% men and 56% women. Patients were 94% Caucasian, 5% Black and 1% other races. Patients with serum creatinine level more than 2 mg/dL (180 µmol/L), or platelet count less than 100,000/mm 3 were excluded from the trial. For both groups, treatment continued for at least 5 days with a treatment duration range 7 ± 2 days, and both treatment groups received Vitamin K antagonist therapy initiated within 72 hours after the first study drug administration and continued for 90 ± 7 days, with regular dose adjustments to achieve an INR of 2-3. The primary efficacy endpoint was confirmed, symptomatic, recurrent VTE reported up to Day 97. The efficacy data are provided in Table 7 below. 3 The 95% confidence interval for the treatment difference for total VTE was: (-3.0% to 0.5%). the treatment of acute pulmonary embolism when administered in conjunction with warfarin sodium when initial therapy is administered in the hospital. ARIXTRA Injection is contraindicated in patients with severe renal impairment (creatinine clearance <30 mL/min). ARIXTRA is eliminated primarily by the kidneys, and such patients are at increased risk for major bleeding episodes (see WARNINGS : Renal Impairment ). ARIXTRA prophylactic therapy is contraindicated in patients with body weight <50 kg undergoing hip fracture, hip replacement or knee replacement surgery, and abdominal surgery. During the randomized clinical trials of prophylaxis in the peri-operative period following hip fracture, hip replacement, or knee replacement surgery, occurrence of major bleeding was doubled in patients with a body weight <50 kg compared with those with a body weight >/=50 kg (5.4% versus 2.1%). In the clinical trial in patients undergoing abdominal surgery, the major bleeding rate was also higher in patients with a body weight <50 kg as compared to those with a body weight >/=50 kg (5.3% versus 3.3%), respectively. The use of ARIXTRA is contraindicated in patients with active major bleeding, bacterial endocarditis, in patients with thrombocytopenia associated with a positive in vitro test for anti-platelet antibody in the presence of fondaparinux sodium, or in patients with known hypersensitivity to fondaparinux sodium. ARIXTRA Injection is not intended for intramuscular administration. ARIXTRA cannot be used interchangeably (unit for unit) with heparin, low molecular weight heparins or heparinoids, as they differ in manufacturing process, anti-Xa and anti-IIa activity, units, and dosage. Each of these medicines has its own instructions for use. Renal Impairment (See also CONTRAINDICATIONS ): Hip Fracture, Hip Replacement and Knee Replacement Surgeries: Major bleeding in patients receiving prophylactic therapy in hip fracture, hip replacement, or knee replacement surgery occurred in 1.6% (25/1,565) of patients with normal renal function, in 2.4% (31/1,288) with mild renal impairment, in 3.8% (19/504) with moderate renal impairment, and in 4.8% (4/83) with severe renal impairment. When ARIXTRA was used according to the recommended timing of the first injection (6 to 8 hours after surgery), major bleeding occurred in 1.8% (16/905) of patients with normal renal function, in 2.2% (15/675) with mild renal impairment, in 2.3% (6/265) with moderate renal impairment, and in 0% (0/40) with severe renal impairment. Abdominal Surgery: Major bleeding in patients receiving prophylactic therapy in abdominal surgery occurred in 2.1% (13/606) of patients with normal renal function, in 3.6% (22/613) with mild renal impairment, in 6.7% (12/179) with moderate renal impairment, and in 7.1% (1/14) with severe renal impairment. When ARIXTRA was used according to the recommended timing of the first injection (6 to 8 hours after surgery), major bleeding occurred in 2.1% (10/467) of patients with normal renal function, in 3.3% (16/481) with mild renal impairment, in 5.8% (8/137) with moderate re-nal impairment, and in 7.7% (1/13) with severe renal impairment. Treatment of Deep Vein Thrombosis and Pulmonary Embolism: Major bleeding in patients receiving treatment for DVT and PE occurred in 0.4% (4/1,132) of patients with normal renal function, in 1.6% (12/733) with mild renal impairment, in 2.2% (7/318) with moderate renal impairment, and in 7.3% (4/55) with severe renal impairment. Renal function should be assessed periodically in patients receiving ARIXTRA. The drug should be discontinued immediately in patients who develop severe renal impairment while on therapy. After discontinuation of ARIXTRA, its anticoagulant effects may persist for 2-4 days in patients with normal renal function (i.e., at least 3-5 half-lives). The anticoagulant effects of ARIXTRA may persist even longer in patients with renal impairment (see CLINICAL PHARMACOLOGY ). Hemorrhage: ARIXTRA Injection, like other anticoagulants, should be used with extreme caution in conditions with increased risk of hemorrhage, such as congenital or acquired bleeding disorders, active ulcerative and angiodysplastic gastrointestinal disease, hemorrhagic stroke, or shortly after brain, spinal, or ophthalmological surgery, or in patients treated concomitantly with platelet inhibitors. Laboratory Testing: Because routine coagulation tests such as Prothrombin Time (PT) and Activated Partial Thromboplastin Time (aPTT) are relatively insensitive measures of ARIXTRA activity and international standards of heparin or LMWH are not calibrators to measure anti-Factor Xa activity of ARIXTRA, if during ARIXTRA therapy unexpected changes in coagulation parameters or major bleeding occurs, ARIXTRA should be discontinued (see PRECAUTIONS : Laboratory Tests ). Neuraxial Anesthesia and Post-operative Indwelling Epidural Catheter Use: Spinal or epidural hematomas, which may result in long-term or permanent paralysis, can occur with the use of anticoagulants and neuraxial (spinal/epidural) anesthesia or spinal puncture. The risk of these events may be higher with post-operative use of indwelling epidural catheters or concomitant use of other drugs affecting hemostasis such as NSAIDs (see Boxed Warning for Spinal/Epidural Hematomas ). In spontaneous post-marketing reports, there have been several cases of epidural or spinal hematoma that have occurred in association with the use of ARIXTRA SC injection. Thrombocytopenia: Thrombocytopenia can occur with the administration of ARIXTRA. Moderate thrombocytopenia (platelet counts between 100,000/mm 3 and 50,000/mm 3 ) occurred at a rate of 3.0% in patients given ARIXTRA 2.5 mg in the peri-operative hip fracture, hip replacement or knee replacement surgery, and abdominal surgery clinical trials. Severe thrombocytopenia (platelet counts less than 50,000/mm 3 ) occurred at a rate of 0.2% in patients given ARIXTRA 2.5 mg in these clinical trials. During extended prophylaxis, no cases of moderate or severe thrombocytopenia were reported. Thrombocytopenia of any degree should be monitored closely. If the platelet count falls below 100,000/mm 3 , ARIXTRA should be discontinued. General: ARIXTRA Injection should be administered according to the recommended regimen, especially with respect to the timing of the first dose after surgery. In the hip fracture, hip replacement, knee replacement, or abdominal surgery clinical studies, the administration of ARIXTRA before 6 hours after surgery has been associated with an increased risk of major bleeding (see ADVERSE REACTIONS : Hemorrhage and DOSAGE AND ADMINISTRATION ). ARIXTRA Injection should be used with care in patients with a bleeding diathesis, uncontrolled arterial hypertension, or a history of recent gastrointestinal ulceration, diabetic retinopathy, and hemorrhage. ARIXTRA Injection should be used with caution in elderly patients (see PRECAUTIONS : Geriatric Use ). ARIXTRA should be used with caution in patients with a low body weight (<50 kg) for the treatment of PE and DVT. ARIXTRA Injection should not be mixed with other injections or infusions. If thrombotic events occur despite ARIXTRA prophylaxis, appropriate therapy should be initiated. Laboratory Tests: Periodic routine complete blood counts (including platelet count), serum creatinine level, and stool occult blood tests are recommended during the course of treatment with ARIXTRA Injection. When administered at the recommended doses, routine coagulation tests such as Prothrombin Time (PT) and Activated Partial Thromboplastin Time (aPTT) are relatively insensitive measures of ARIXTRA activity, and are therefore, unsuitable for monitoring. The anti-Factor Xa activity of fondaparinux sodium can be measured by anti-Xa assay using the appropriate calibrator (fondaparinux). Since the international standards of heparin or LMWH are not appropriate calibrators, the activity of fondaparinux sodium is expressed in milligrams (mg) of the fondaparinux and cannot be compared with activities of heparin or low molecular weight heparins (see CLINICAL PHARMACOLOGY : Pharmacodynamics and Pharmacokinetics and WARNINGS : Laboratory Testing ). Drug Interactions: In clinical studies performed with ARIXTRA, the concomitant use of oral anticoagulants (warfarin), platelet inhibitors (acetylsalicylic acid), NSAIDs (piroxicam), and digoxin did not significantly affect the pharmacokinetics/pharmacodynamics of fondaparinux sodium. In addition, ARIXTRA neither influenced the pharmacodynamics of warfarin, acetylsalicylic acid, piroxicam, and digoxin, nor the pharmacokinetics of digoxin at steady state. Agents that may enhance the risk of hemorrhage should be discontinued prior to initiation of ARIXTRA therapy. If co-administration is essential, close monitoring may be appropriate. In an in vitro study in human liver microsomes, inhibition of CYP2A6 hydroxylation of coumarin by fondaparinux (200 µM i.e., 350 mg/L) was 17-28%. Inhibition of the other isozymes evaluated (CYPs 2A1, 2C9, 2C19, 2D6, 3A4, and 3E1) was 0-16%. Since fondaparinux does not markedly inhibit CYP450s (CYP1A2, CYP2A6, CYP2C9, CYP2C19, CYP2D6, CYP2E1, or CYP3A4) in vitro, fondaparinux sodium is not expected to significantly interact with other drugs in vivo by inhibition of metabolism mediated by these isozymes. Carcinogenesis, Mutagenesis, Impairment of Fertility: No long-term studies in animals have been performed to evaluate the carcinogenic potential of fondaparinux sodium. Fondaparinux sodium was not genotoxic in the Ames test, the mouse lymphoma cell (L5178Y/TK +/- ) forward mutation test, the human lymphocyte chromosome aberration test, the rat hepatocyte unscheduled DNA synthesis (UDS) test, or the rat micronucleus test. Pregnancy: Teratogenic Effects: Pregnancy Category B. Reproduction studies have been performed in pregnant rats at subcutaneous doses up to 10 mg/kg/day (about 32 times the recommended human dose based on body surface area) and pregnant rabbits at subcutaneous doses up to 10 mg/kg/day (about 65 times the recommended human dose based on body surface area) and have revealed no evidence of impaired fertility or harm to the fetus due to fondaparinux sodium. There are, however, no adequate and well-controlled studies in pregnant women. Because animal reproduction studies are not always predictive of human response, this drug should be used during pregnancy only if clearly needed. Nursing Mothers: Fondaparinux sodium was found to be excreted in the milk of lactating rats. However, it is not known whether this drug is excreted in human milk. Because many drugs are excreted in human milk, caution should be exercised when fondaparinux sodium is administered to a nursing mother. Pediatric Use: Safety and effectiveness of ARIXTRA in pediatric patients have not been established. Geriatric Use: ARIXTRA should be used with caution in elderly patients. Over 3,000 patients, 65 years and older, have received ARIXTRA 2.5 mg in randomized clinical trials. Over 1,200 patients, 65 years and older, have received the ARIXTRA treatment regimen in the DVT and PE treatment clinical trials. The efficacy of ARIXTRA in the elderly (equal to or older than 65 years) was similar to that seen in younger patients (younger than 65 years). In the peri-operative hip fracture, hip replacement, or knee replacement surgery clinical trials with patients receiving ARIXTRA 2.5 mg the risk of ARIXTRA-associated major bleeding increased with age: 1.8% (23/1,253) in patients <65 years, 2.2% (24/1,111) in those 65-74 years, and 2.7% (33/1,227) in those >/=75 years. Serious adverse events increased with age for patients receiving ARIXTRA. In patients undergoing 3 weeks of extended prophylaxis following one week of peri-operative prophylaxis after hip fracture surgery, the incidence of major bleeding was: 1.9% (1/52) in patients <65 years, 1.4% (1/71) in those 65-74 years, and 2.9% (6/204) in those >/=75 years. In the abdominal surgery clinical trial, the risk of ARIXTRA-associated major bleeding increased with age: 3.0% (19/644) in patients <65 years, 3.2% (16/507) in those 65-74 years, and 5.0% (14/282) in those >/=75 years. In the DVT and PE treatment clinical trials with patients receiving the ARIXTRA treatment regimen, the risk of ARIXTRA-associated major bleeding increased with age: 0.6% (7/1151) in patients <65 years, 1.6% (9/560) in those 65-74 years, and 2.1% (12/583) in those >/=75 years. Careful attention to dosing directions and concomitant medications (especially anti-platelet medication) is advised (see CLINICAL PHARMACOLOGY and PRECAUTIONS : General ). Fondaparinux sodium is substantially excreted by the kidney, and the risk of toxic reactions to ARIXTRA may be greater in patients with impaired renal function. Because elderly patients are more likely to have decreased renal function, it may be useful to monitor renal function (see CONTRAINDICATIONS and WARNINGS : Renal Impairment ). Because clinical trials are conducted under widely varying conditions, adverse reaction rates observed in the clinical trials of a drug cannot be directly compared to rates in the clinical trials of another drug and may not reflect the rates observed in practice. The adverse reaction information from clinical trials does, however, provide a basis for identifying possible adverse events and for approximating rates. The data described below reflect exposure in 8,877 patients randomized to ARIXTRA Injection in controlled trials of hip fracture, hip replacement, major knee, or abdominal surgeries, and DVT and PE treatment. Patients received ARIXTRA primarily in 2 large peri-operative dose-response trials (n = 989), 4 active-controlled peri-operative trials with enoxaparin sodium (n = 3,616), and an extended prophylaxis trial (n = 327), an active-controlled trial with dalteparin sodium (n = 1,425), a dose-response trial in DVT treatment (n = 111), an active-controlled trial with enoxaparin sodium in DVT treatment (n = 1,091), and an active-controlled trial with heparin in PE treatment (n = 1,092) (see CLINICAL STUDIES ). Hemorrhage: During ARIXTRA administration, the most common adverse reactions were bleeding complications (see WARNINGS ). Hip Fracture, Hip Replacement and Knee Replacement Surgery: The rates of major bleeding events reported during the hip fracture, hip replacement, or knee replacement surgery clinical trials with ARIXTRA 2.5 mg Injection are provided in Tables 8 and 9 below. 1 Major bleeding was defined as clinically overt bleeding that was (1) fatal, (2) bleeding at critical site (e.g. intracranial, retroperitoneal, intra-ocular, pericardial, spinal, or into adrenal gland), (3) associated with re-operation at operative site, or (4) with a bleeding index (BI) >/=2 calculated as [number of whole blood or packed red blood cell units transfused + [(pre-bleeding) - (post-bleeding)] hemoglobin (g/dL) values]. 2 Enoxaparin sodium dosing regimen: 30 mg every 12 hours or 40 mg once daily. 3 Not approved for use in patients undergoing hip fracture surgery. 4 During noncomparative, unblinded peri-operative prophylaxis, major bleeding was reported in 22/737 (3.0%) patients. Fifteen (15) of these 22 patients continued to receive ARIXTRA in extended prophylaxis. After randomization, 4/327 (1.2%) patients experienced major bleeding for the first time. 5 p value versus enoxaparin sodium: <0.01, 95% confidence interval: (1.1%, 3.3%) in ARIXTRA group versus (0.0%, 1.1%) in enoxaparin sodium group. 1 Enoxaparin sodium dosing regimen: 30 mg every 12 hours or 40 mg once daily. 3 Major bleeding was defined as clinically overt bleeding that was (1) fatal, (2) bleeding at critical site (e.g. intracranial, retroperitoneal, intra-ocular, pericardial, spinal, or into adrenal gland), (3) associated with re-operation at operative site, or (4) with a bleeding index (BI) >/=2. 4 During non-comparative, unblinded, peri-operative prophylaxis, 2 fatal bleeds were reported (one in a 50 kg patient, one in a severe renal failure patient). 5 BI >/=2: overt bleeding associated only with a bleeding index (BI) >/=2 calculated as [number of whole blood or packed red blood cell units transfused + [(pre-bleeding) - (post-bleeding)] hemoglobin (g/dL) values]. 6 Minor bleeding was defined as clinically overt bleeding that was not major. A separate analysis of major bleeding across all randomized, controlled, peri-operative, prophylaxis clinical studies of hip fracture, hip replacement, or knee replacement surgery according to the time of the first injection of ARIXTRA after surgical closure was performed in patients who received ARIXTRA only post-operatively. In this analysis, the incidences of major bleeding were as follows: <4 hours was 4.8% (5/104), 4-6 hours was 2.3% (28/1196), 6-8 hours was 1.9% (38/1965). In all studies, the majority (>/=75%) of the major bleeding events occurred during the first 4 days after surgery. Abdominal Surgery: The rates of major bleeding reported during the abdominal surgery clinical trial with ARIXTRA 2.5 mg are provided in Table 10 below. 2 Minor bleeding was defined as clinically overt bleeding that was not major. A separate analysis of major bleeding according to the time of the first injection of ARIXTRA after surgical closure was performed. In this analysis the incidences of major bleeding were as follows: <6 hours was 3.4% (9/263) and 6-8 hours was 2.9% (32/1112). Treatment of Deep Vein Thrombosis and Pulmonary Embolism: The rates of bleeding events reported during the DVT and PE clinical trials with the ARIXTRA injection treatment regimen are provided in Table 11 below. 1 Bleeding rates are during the study drug treatment period (approximately 7 days). Patients were also treated with Vitamin K antagonists initiated within 72 hours after the first study drug administration. 2 Major bleeding was defined as clinically overt: - and/or contributing to death - and/or in a critical organ including intracranial, retroperitoneal, intraocular, spinal, pericardial, or adrenal gland - and/or associated with a fall in hemoglobin level >/=2 g/dL - and/or leading to a transfusion >/=2 units of packed red blood cells or whole blood. 3 Minor bleeding was defined as clinically overt bleeding that was not major. Thrombocytopenia: See WARNINGS : Thrombocytopenia . Local Reactions: Mild local irritation (injection site bleeding, rash, and pruritus) may occur following subcutaneous injection of ARIXTRA. Elevations of Serum Aminotransferases: In the peri-operative prophylaxis randomized clinical trials of 7 ± 2 days asymptomatic increases in aspartate (AST [SGOT]) and alanine (ALT [SGPT]) aminotransferase levels greater than 3 times the upper limit of normal of the laboratory reference range have been reported in 1.7% and 2.6% of patients, respectively, during treatment with ARIXTRA 2.5 mg Injection versus 3.2% and 3.9%, of patients, respectively, during treatment with enoxaparin sodium 30 mg every 12 hours or 40 mg once daily enoxaparin sodium. Such elevations are fully reversible and are rarely associated with increases in bilirubin. In the extended prophylaxis clinical trial no significant differences in aspartate (AST [SGOT]) and alanine (ALT [SGPT]) aminotransferase levels between ARIXTRA 2.5 mg Injection and placebo treated patients were observed. In the DVT and PE treatment clinical trials asymptomatic increases in aspartate (AST [SGOT]) and alanine (ALT [SGPT]) aminotransferase levels greater than 3 times the upper limit of normal of the laboratory reference range have been reported in 0.7% and 1.3% of patients, respectively, during treatment with the ARIXTRA injection treatment regimen. In comparison, these increases have been reported in 4.8% and 12.3%, of patients, respectively, in the DVT treatment trial during treatment with enoxaparin sodium 1 mg/kg every 12 hours, and in 2.9% and 8.7%, of patients, respectively, in the PE treatment trial during treatment with aPTT adjusted heparin. Other Adverse Events: Other adverse events that occurred during treatment with ARIXTRA, or enoxaparin sodium in clinical trials with patients undergoing hip fracture surgery, hip replacement surgery, or knee replacement surgery and that occurred at a rate of at least 2% in either treatment group, are provided in Table 12 below. Other adverse events that occurred during treatment with ARIXTRA or dalteparin sodium in clinical trials with patients undergoing abdominal surgery and that occurred at a rate of at least 2% in either treatment group are provided in Table 13 below. Other adverse events that occurred during treatment with ARIXTRA, enoxaparin sodium, or heparin in the DVT and PE treatment clinical trials and that occurred at a rate of at least 2% in any treatment group are provided in Table 14 below. 3 Localized blister coded as bullous eruption. Symptoms/Treatment: There is no known antidote for ARIXTRA Injection. Overdose of ARIXTRA may lead to hemorrhagic complications. Overdosage associated with bleeding complications should lead to treatment discontinuation and initiation of appropriate therapy. Data obtained in patients undergoing chronic intermittent hemodialysis suggest that ARIXTRA clearance can increase by 20% during hemodialysis. ARIXTRA Injection is administered by subcutaneous injection once daily. Deep Vein Thrombosis Prophylaxis Following Abdominal Surgery: In patients undergoing abdominal surgery, the recommended dose of ARIXTRA is 2.5 mg administered by subcutaneous injection once daily after hemostasis has been established. The initial dose should be given 6 to 8 hours after surgery. Administration before 6 hours after surgery has been associated with an increased risk of major bleeding. The usual duration of administration is 5 to 9 days, and up to 10 days of ARIXTRA injection has been administered. ARIXTRA Injection is provided in a single dose, prefilled syringe affixed with an automatic needle protection system. ARIXTRA is administered by subcutaneous injection. It must not be administered by intramuscular injections. ARIXTRA is intended for use under a physician's guidance. Patients may self-inject only if their physician determines that it is appropriate and with medical follow-up as necessary. Proper training in subcutaneous injection technique should be provided. To avoid the loss of drug when using the pre-filled syringe, do not expel the air bubble from the syringe before the injection. Administration should be made in the fatty tissue, alternating injection sites (e.g., between the left and right anterolateral or the left and right posterolateral abdominal wall). Wipe the surface of the injection site with an alcohol swab. Twist the plunger cap and remove it. 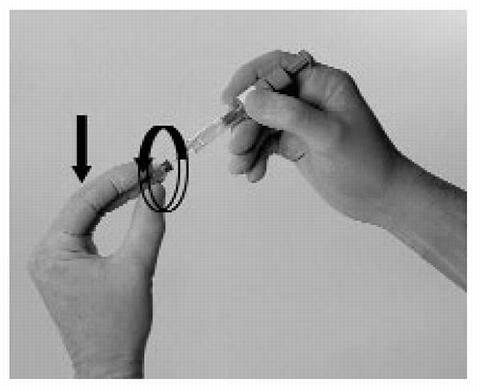 Hold the syringe with either hand and use your other hand to twist the rigid needle guard (covers the needle) counter-clockwise. Pull the rigid needle guard straight off the needle. Pinch a fold of skin at the injection site between your thumb and forefinger and hold it throughout the injection. Hold the syringe with your thumb on the top pad of the plunger rod and your next 2 fingers on the finger grips on the syringe barrel. Pay attention to avoid sticking yourself with the exposed needle. 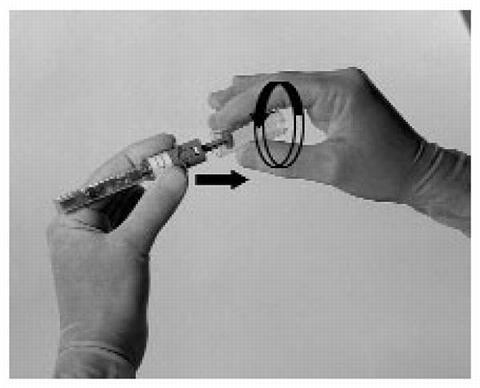 Insert the full length of the syringe needle perpendicularly into the skin fold held between the thumb and forefinger. Push the plunger rod firmly with your thumb as far as it will go. This will ensure you have injected all the contents of the syringe. When you have injected all the contents of the syringe, the plunger should be released. The plunger will then rise automatically while the needle withdraws from the skin and retracts into the security sleeve. Discard the syringe into the sharps container without replacing the rigid needle guard. The needle is pulled back into the security sleeve and the white safety indicator appears above the blue upper body.